Where's the Art in My Neighborhood ? What is the Open Stuido Tour ? This Unique Open Studio Tour Unveils Local California Artist Workshops, Extraordinary Art and their Remarkable Makers. 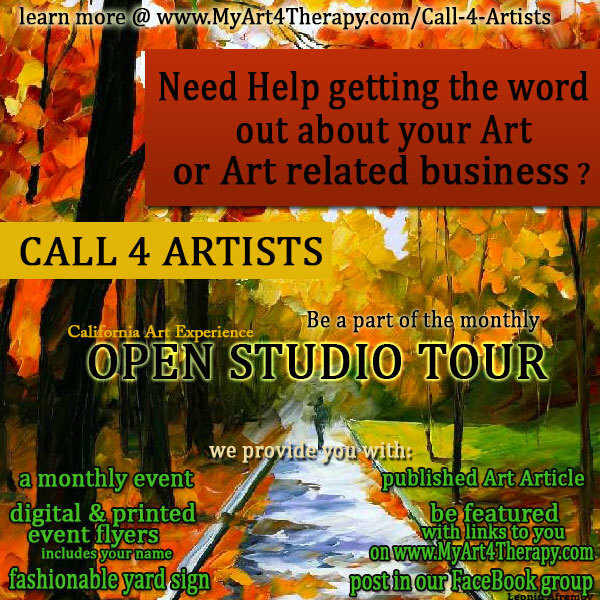 www.MyArt4Therapy.com Welcomes You to Enjoy the California Art Experience, Open Studio Tour. Gather Your Family, Friends and Neighbors to Follow the Route and Enjoy the Free Art Adventure. Build Connections that Extend Far Beyond the Tour. The Self-Guided Journey is an Educational Opportunity for Young and Old to Converse with Artists and Watch them In-Action. Learn What Inspires Them, Why They Create and Appreciate the Personal Stories Behind Each Captivating Piece. When is it ? Join Us the First Sunday of Every Month from 10am to 5pm all year 'round. Where is it ? The Tour takes place throughout California, from the Beach to the Mountains. Who can go on the Tour ? Absolutley Anyone and Everyone of all ages and all backgrounds. Follow the online map, artist signs and your sense of adventure. This is an excellent way to spend the day alone, with family or with friends. Get out on foot, bicycle, public transit or car and enjoy the day ! Who are the Open Studio Artists ? They are your friends, neighbors and often times people you would never meet. Some are shy and some are outspoken, others may be Art hobbyists or they might be full-time Art enthusiasts - regardless, they are all passionate about Art and it's therapeutic properties. What is a Studio and what is it like to visit them ? A Studio is a place where someone makes Art. It could be a room in their house, a space in a warehouse or something different altogether. Everyone has a different method to their Art. It might be clean, messy, funky, classic, huge or teeny tiny. Open Studios give you an incredible opportunity to see the amazing variety and vast approaches of technique and style. These Artists have paid for the Opportunity to Meet You. It is important to appreciate the Artist and their process of creating. They want to share, so, ask questions. If you enjoy soaking it all in quiety, that's encouraged too ! This is an educational, growing experience and there is no feeling more rewarding that unconditional love and compassion for one another. How do I find the Artists and their Studios ? 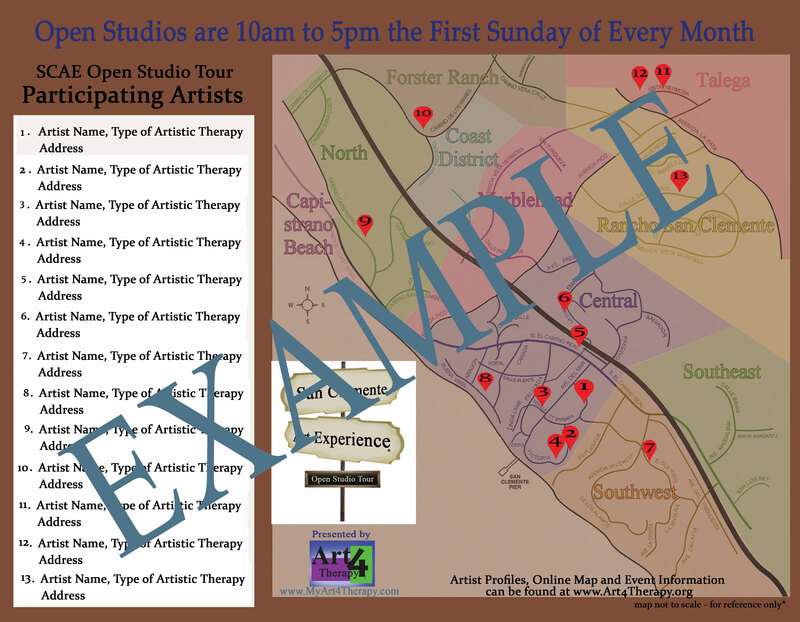 Get Your Tour Map Online at the Open Studio Tours page of the website. Registration is easy and online. Bonus: By registering and participating in the Open Studio Tour, you are providing jobs for students in the Arts and Business Fields. Art4Therapy hires students at fair wages and teaches them hands-on, technical and social skills - offering tools to help them create a positivity within themselves and for their future. Get involved, show your community support and help cancer research for pets and people. with the July edition of the Open Studio Tour. The deadline to register is: midnight, May 15th, 2019. 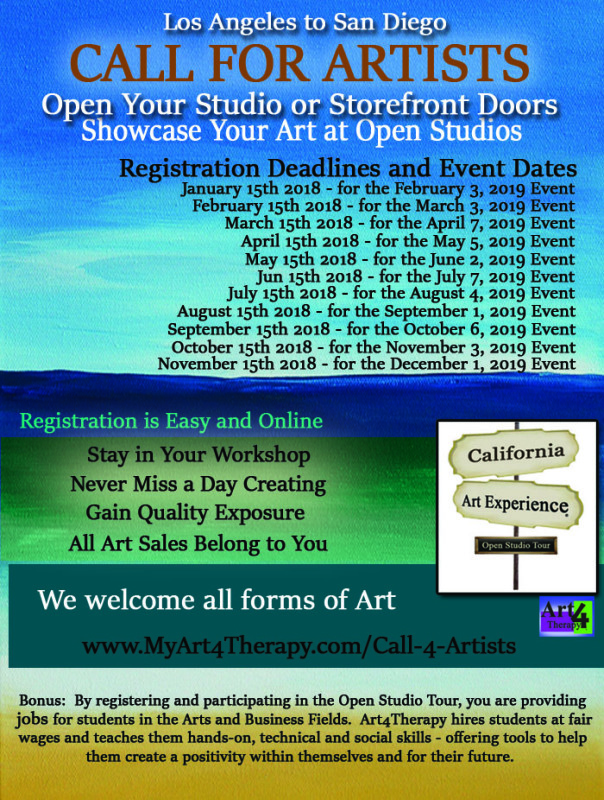 Registering is easy and online at: http://www.MyArt4Therapy.com/Call-4-Artists. 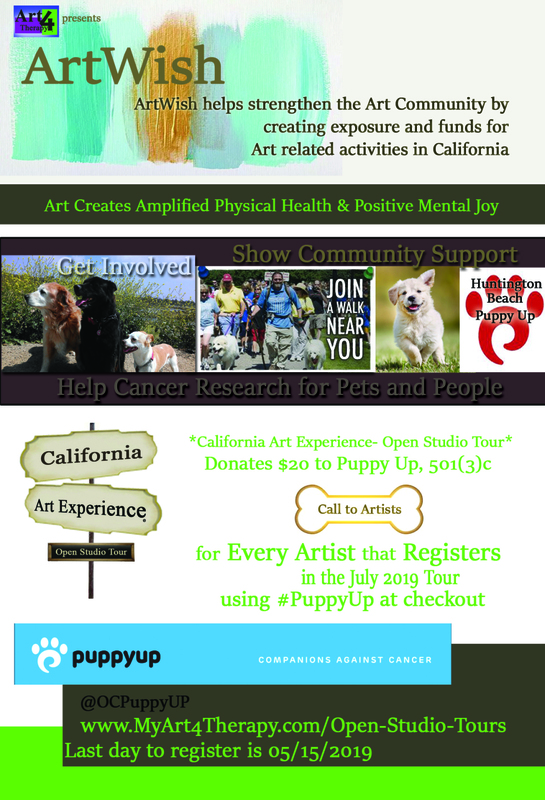 To lean more about Puppy Up- Companions Against Cancer, learn health tips for your pet, make a donation or sign-up for the Huntington Beach Puppy Up Walk, please visit them on the web at: https://www.facebook.com/OCPuppyUP/?fref=ts . Need to raise money to grow your Art related project/event/show or business ? Here is a great way to build the Art Community by doing so. Collaborate with us. It's easy to register your unique #KeyCode with the free online application. 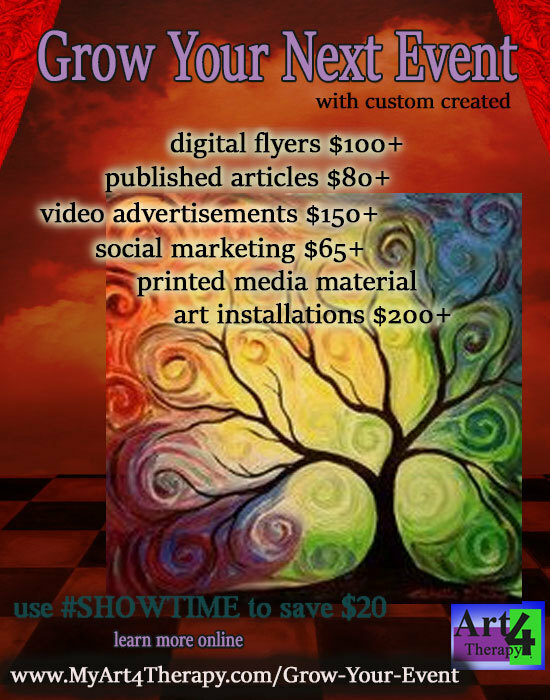 We are excited to help your campaign and spread the word about your Artistic endeavor. 1. The ArtWish # campaign is free to use. Our manual labor is dedicated on free will in the hopes that everyone involved will grow. 2. We will create a text blurb with a digital flyer and submit it to you for approval before we share it in our social media circles; including but not limited to: our website, our fb group page, directly to our pool of Artists, Art Enthusiasts, online groups, local news, community magazines, radio, blog, pod casts and good ol' word of mouth. We ask that you also use the flyer to boost awareness in your circles or favorite groups that support you and your cause. website, starting on the landing page, then rotating into the Art Articles & Blog Page. Your digital flyer will be featured on the Current Events page including links to you and your cause. 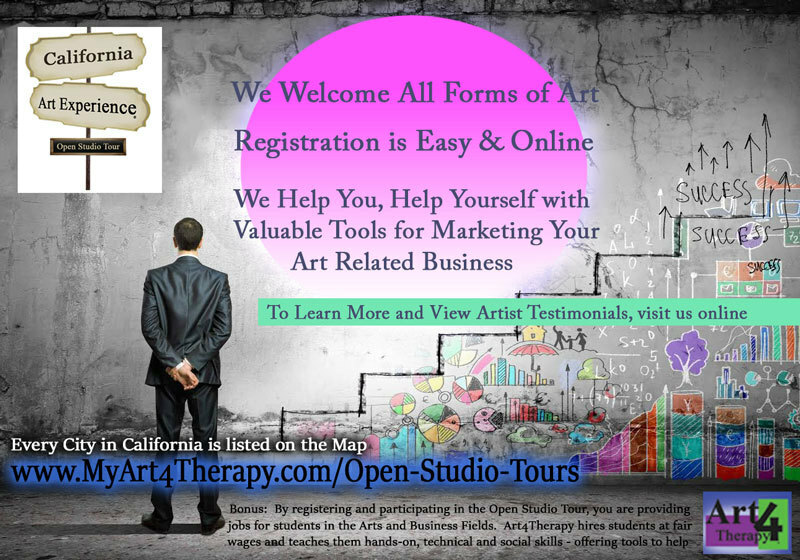 If you join the Open Studio Tour, you will also be featured on the Participating Artists page, amongst a variety of other useful marketing tools. 4. If you wish to have an event that coincides with your fundraiser on the 1st Sunday of any month and would like to be on the map of the Open Studio Tour, we offer you the keycode #ARTWISH to register at half off. You will also receive a receipt for your taxes for advertising. 5. We will donate $20 for every Artist that registers for the tour on your campaign using your unique #keycode and offer the funds to you within 7 working days of the deadline to register. Grow Your Next Event with these Amazing Tools from www.MyArt4Therapy.com. * Digital Flyers are an excellent way to share information online about your public or private event, special occasion, call for artists, advertising a unique business or product and they help you build a professional portfolio. 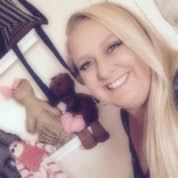 * Video Advertisements are incredible tools for sharing who you are, what you create and where all of the magic happens. Video Ads provide a combination of sight, sound and motion that actively engage curious viewers. * Published Articles create beautiful stories about who you are, what you do, what you believe in and everything in-between. Releasing articles keeps viewers current and up-to-date in your life both personally and professionally. * Social Marketing captures an audience that is unique to the online world, allowing information and images to be shared instantly and abroad including online communities, active groups, local organizations, news, radio and blogs. * Printed Media Material leaves an in-person, lasting impression with professional business cards, tri-fold brochures, poster card ads, event flyers, invitations, contest & show announcements, window signs and banners to name a few. * Art Installations are perfect for anybody who loves and appreciates Art and wants to create a unique presence in their home, office or social gathering. Share a priceless and memorable experience by highlighting fascinating Art customized to your wishes by way of Art on your walls or Artists in-person and in-action. Visit www.MyArt4Therapy.com/Grow-Your-Event for more information, online submissions & easy checkout. 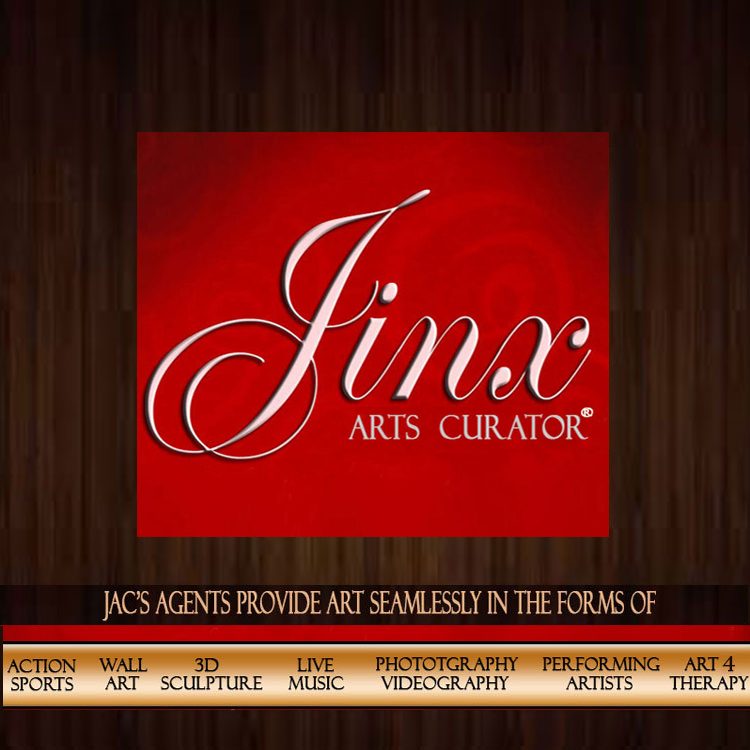 Jinx, Arts Curator is a Unique Art Agency that Provides Quality, Interactive, Educational Art Adventures with an In-Person & Online Presence for Businesses to Create an Opportunity to Highlight their Services by Showcasing Local Art and Featuring Local Talent. Jinx, Arts Curator and her team make it fun and easy to feature Art as a unique form of entertainment, one that highlights any type of occasion. #JAC Houses a Wide Array of Art from: Action Art, Action Sports Art, Ocean Art, Wall Art, Sculpture, Live Visual Art, Live Music, Live Photography/Videography, Interactive Art Classes, Live Art Demonstrations, Live Art Discussions, Art Hypnosis Class, Dancing & Movement, Interactive Entertaining Performing Art, Motivational Speaking, Book Releases/Signings, Live Poetry Sessions, Comedy Shows, Magic Shows, Locally Hand Crafted Organic Unique Treats/Libations, Artistic Coaching, Educational & Healing Tools Through Art and Any Every Other Way You Can Think of to Get Art In The Mix. JAC and it’s Agents Provide All Forms of Art Seamlessly to You. You Select the Event and we help you Coordinate the Art, in all of it’s facets. * Curations, Installation, Art Shows, Events, 30 Day Art Rotations, 1 Day or Night Pop-Up Galleries, Showcasings, Receptions, Exhibits, Celebrations and Venues start at $299. * Presentations, Art Classes, Live Art Demonstrations, Live Art Discussions, Art Hypnosis Class, Dancing & Movement, Interactive Entertaining Performing Art, Motivational Speaking, Book Signing, Live Poetry Readings, Comedy Shows and Educational Healing Tools Through Art all start at $250. * Photography and Videography start at $150. We offer a wide variety of niche photographers and videographers for ANY occasion. * JAC has the Ability to Assemble a Full Art Experience including but not limited to: Action Art, Action Sports Art, Wall Art, Sculpture, Live Art, Live Music, Live Photography/Videography, Live Performances, Locally Handmade Treats and Organic Handcrafted and Locally Made Libations to name a few. The Pricing starts at $200. * JAC Provides a Digital Flyer for You to Use in Your Social Media Circles (free with a purchased Curation Service) - keep everyone in the loop & invited to your shindigs. You can also post on the JAC FB group California Art Experience, Open Studio Tour. Need help circulating the digital flyer - JAC loves to support your Art Events and Wants to Promote the Artists, this starts at $85. * Complete a Simple Questionnaire, Purchase the Curation and Enjoy Focusing on Your Agenda - Knowing that a JAC Agent Provides Seamless Assistance. * We will find the Art you are looking for. Our community of Artists is wide and varies in form and genres. You'll be suprised - we can find almost any kind of Art for almost any occassion. 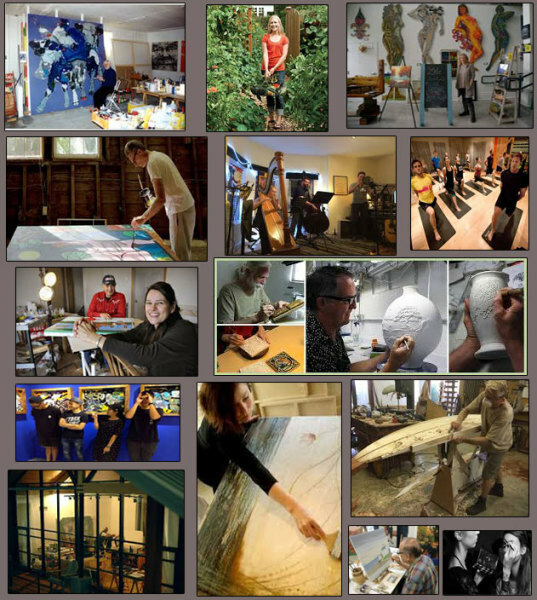 We support all forms of Art and encourage live, interactive Art Entertainment in the Open Studio Tour. The first Sunday of every month from 10am to 5pm, Artists from all over California open up their studios and storefronts to share with the curious public, who they are and what they create. 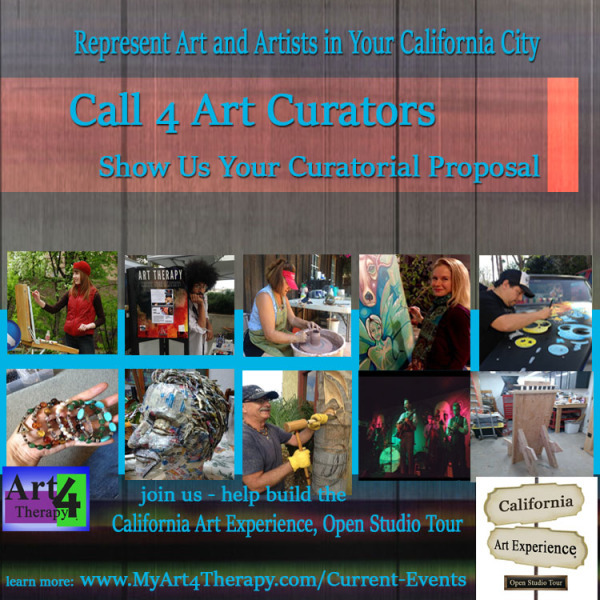 Art Curators, submit your curatorial proposal to www.MyArt4Therapy.com and help tailor this educational Art Experience in your city. Applications are easy, online and free to submit. Use the the unique #keycode provided by MyArt4Therapy.com when registering Artists to receive $20 per registrant. 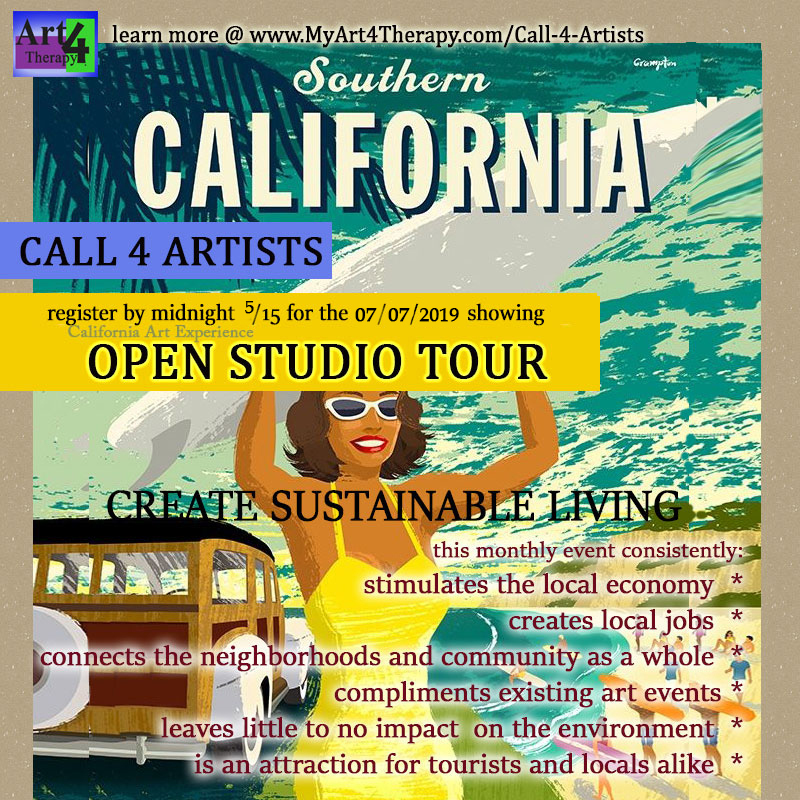 Enjoy creating the Art Scene in your city by being a part of the California Art Experience, Open Studio Tour. 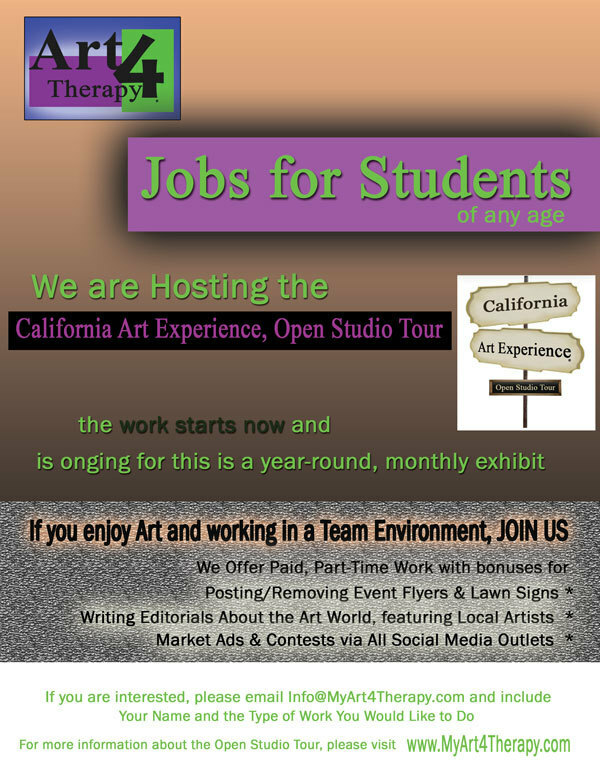 The California Art Experience, Open Studio Tour is seeking students to for light administrative duties and work out on the field. The work is part-time, paid and comes with opportunities to work towards goals and receive bonuses. You will need to be positive in energy, enjoy the Arts, responsible, organized and willing to learn new things while meeting new people. Please visit www.MyArt4Therapy.com and select 'Open Studio Tours'. This will highlight you on the Art show and it's details. Bonus: Artists that register and participate in the Open Studio Tour, are providing jobs for students in the Arts and Business Fields. Art4Therapy hires students at fair wages and teaches them hands-on, technical and social skills - offering tools to help them create a positivity within themselves and for their future.